Saturday Morning Video: Things We Like from JudandKim on Vimeo. In case you didn’t notice, I have two children who are not yet school aged. Two small children plus a house equals disasters. Constant spills. Dumped bins of toys. Urine accidentally shooting out of toilets. Fingers covered in marker that trace their little way up the white banister. These are the marks of my home. Years ago, when I used to babysit for people in THEIR homes (I rarely do this now, because I am not thirteen and I do not charge people to watch their children, but Heavens to Betsy those kiddos are going to mold into our schedule instead of me molding into a different one [otherwise known as my “Free Isn’t Flexible” plan]), I remember being particularly scheeved out about how sticky their high chairs were and how odd their cars smelled. The basic tell-tail signs that children were living in a place made me feel queasy. I almost never ate a meal while babysitting in someone’s home because I am neurotic like that. I also avoided using their toilet and answering the telephone. There were exceptions to these rules (in homes that I deemed clean enough and of course, your house was one of those! I am obviously not talking about you! ), but not too many. Now that I have one of those homes, I wonder how good of a job I am doing at keeping this place in order. I am sure there are things I am missing when I clean, the things you just don’t see because you see it all the time. I don’t always get the backs of their chairs wiped down after a meal or a snack. I don’t mop more than once per week, unless the spills are milk and happen more than once during the day. I don’t dust unless I have to. And that is the secret — to make yourself HAVE TO. We have a small group of people into our home at least once a week and it forces me to break out the Swiffer Dust wand, grab my Pledge MultiSurface (aka Magic) and get my clean on. We aren’t meeting this week, which is perhaps why there is still paperwork scattered throughout the family room and the light switches are all smudgy. 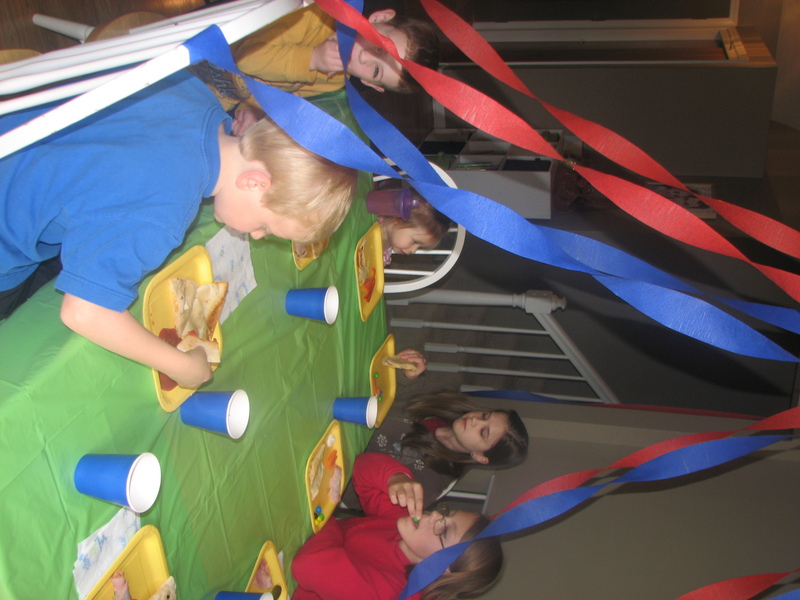 I just booked babysitters for this weekend and I want them to feel free to eat here. Time to bust out that mop. 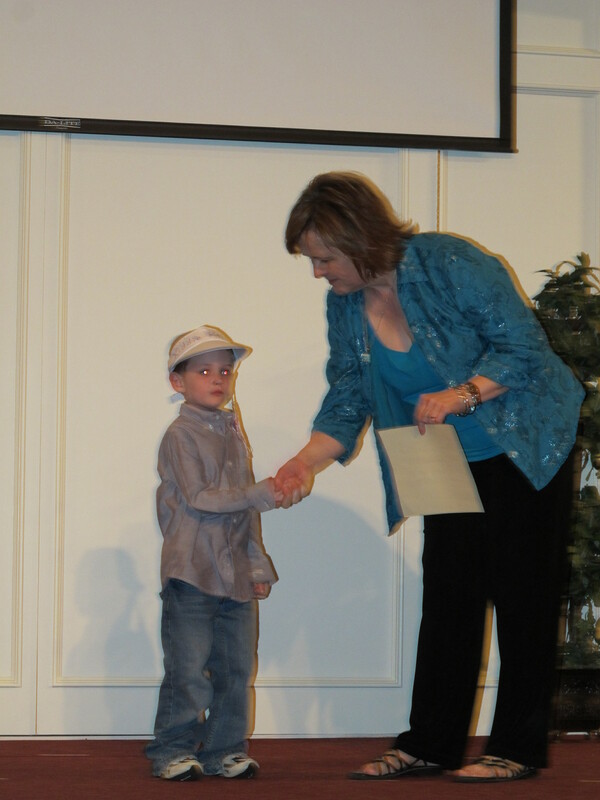 So, the not-graduation preschool thing happened last night. It was an evening filled with interesting costume choices ranging from sequined tank tops, leggings and four inch heels to camisoles (didn’t we used to consider these underwear at some point) and short shorts that revealed all the body art a Mama can (Side note: the children were all dressed tastefully, save the rub on tattoos. Nice work, ‘rents! At least appropriate translates into children’s clothing easier than yours). There were inexplicable visors involved, but I’ll give you a pass, preschool teachers, because I am sure they were cheaper than mortarboards (right? cheaper?). Before I get too much into Joan Rivers’ skin, I’ll focus on the main event: my kid singing on a stage. Kind of. He doesn’t get too into that sort of thing, aka Group Activities (seems appropriate to capitalize. I don’t know why). If everyone is doing one thing, he will probably just make a face that communicates his desire to crawl out of his own skin and be somewhere else, preferrably where these people are not. What can I say? He is his father’s son. Once he got off the stage and was able to come sit down with us, he told us about the CAKE! DOWNSTAIRS! CAKE! This was great news because if you are going to pretend to graduate four and five year olds from something, you better be as legit as possible. Nothing says legitimate like cake. Although that helpful little section over there on the right blames all of my absence on the fact that I was busy, I’m sure you know that there was more to that story. The more is wrapped up in a bunch of things, not the least of which has to do with how much of myself to put out on the internet. In its most basic form, it goes something like “Don’t talk about defecation but poop isn’t necessarily off limits.” See? It’s murky. Regardless, I got all kinds of bound up over the idea of how people interpret me. Not just on this website, but also in real life. I can point to instances where my mouth has injured, isolated or completely ruined my relationship with others. I’m just not very good at maintaining relationships with people (and you know I mean women). I either say something off the cuff that runs so contrary to how normal people communicate (read: with concern for feeling) or I have, in the distant past, just told people to keep it. That last part can be chalked up to immaturity and the inability to see past my current situation. The first one though? That is the one that still plagues me. And I blinked and looked quizzical because I didn’t even know what I had done. I thought the woman was wrong, so I said she was wrong. But that isn’t how women talk to each other. Women are supposed to qualify things and keep things pleasant and calm and all of that. That kind of talking doesn’t ever occur to me. I realize you can’t just chalk stuff up to “that’s not how I work” and then expect other people to just deal with your rudeness, but I also know that in some ways, I am going to keep saying things succinctly and concisely and bluntly because beating around the bush is often completely ineffective. Jud appreciates the cut through the nonsense ability I wield, but even with him I can often forget that he has emotions about the things I am saying and the way in which I am saying them. So, obviously, I am aware that I need to change and, at the same time, I am aware that this can be an asset in the right contexts. And this blog is a context that I wasn’t sure about. Was it causing people to see me as a caricature of my real self? Was it even a representation of the actual way in which I live? Was it worth worrying about another place where people might find me abrasive and my hyperbole annoying? I think it is. It took me a while to get here, but I think it is worth it. You might not agree with me, but you can just stop reading. I think that is a pretty good trade. Monday morning and Jud sneaked out the door about a half hour after Piper made her second potty break during the night. * I rolled over and slept until 6:15 when she was crying to be let out of her baby prison. Somehow she just never musters the strength in those tiny little arms to hoist herself over the railing once she is inside her crib. Getting in with a little help from the rocking chair is totally NBD. Her highness would however prefer assistance if it is early, mid afternoon or late. And make it snappy. I obliged and brought her into bed with me where she proceeded to list off all of things she needed, including her BANKET (who needs the letter L? 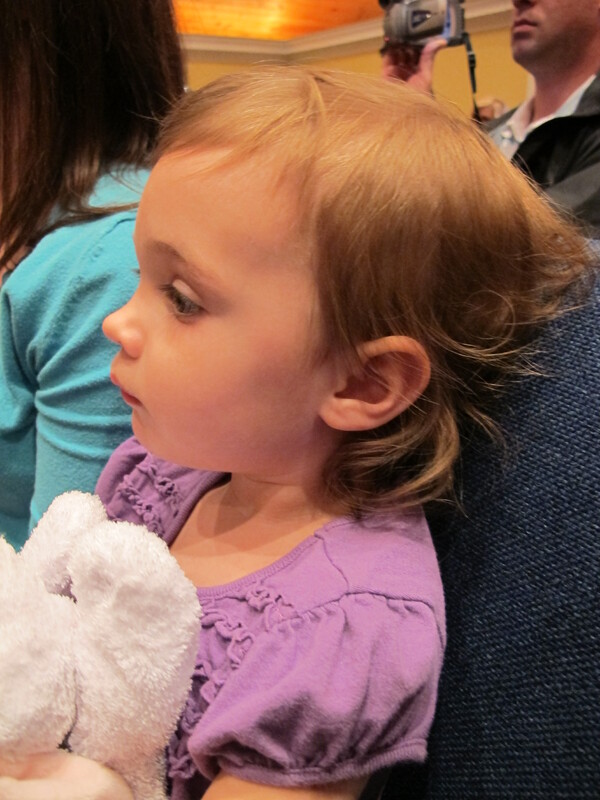 ), her BAIL (tiny Disney princess Belle doll. When pronouncing this world, she is suddenly from North Carolina), her BECKFAST (don’t worry. She isn’t listening to any insane racists who want her to buy gold), her SPECH TREAT (chocolate candy for not attempting to run out of her room when she went to bed) and her DEEDEAN (Gideon was still sleeping, but not for long with Ms. Motormouth at full volume). But look, here are pictures from this weekend to cheer us up! Look, I didn't eat all the oreos. Four were saved! Nothing says PARTY like streamers hanging from a light fixture. 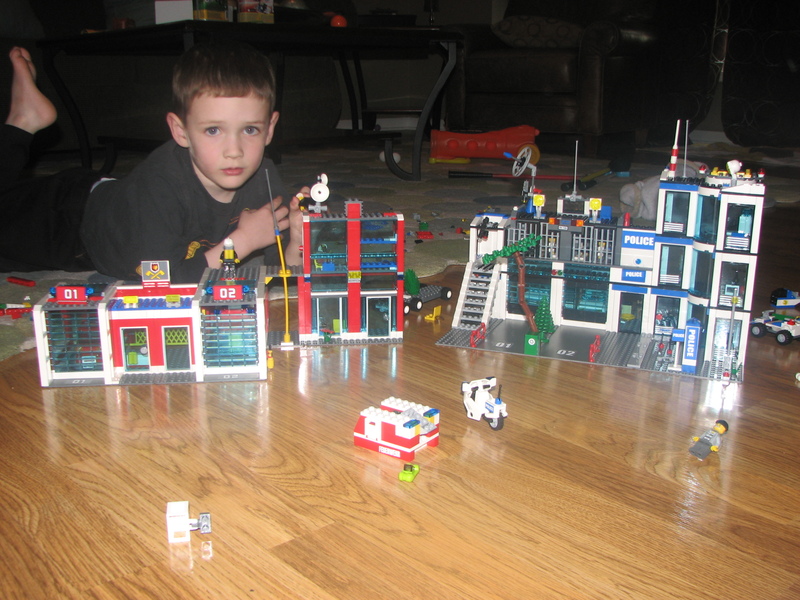 “If there is an emergency in Lego City, call this kid. *Note to self: restrict her liquids sooner than five minutes before she lays down. I’m making Gideon’s fire truck cake. Yes. 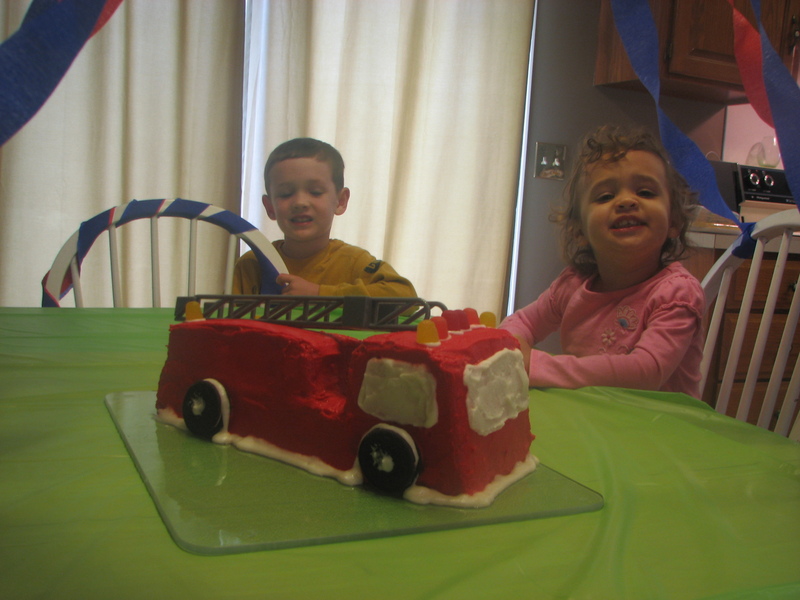 He had a fire truck cake last year too. Yes. I anticipate making this same cake every year for the rest of his life and twice the year that he gets hired on to the department of his choice. His party is tomorrow and his anticipation swings between complete indifference (when he is immersed in Legos) to extreme excitement (when he saw the party favors). I always sort of loose my mind the day before one of the birthday parties. It’s a microcosm of what occurred when we got married. Eating a bunch out of nerves. Fueling myself with coffee to have the energy to get everything done. Heading to the bathroom every four minutes. Getting caught up in the minutiae of the etiquette only to eventually stop caring about all of it about three hours out. Having a good time once I chill the stink out. I am hoping to find my chill a bit earlier each time. May is the month when I always feel like everything is ending. I remember assuming that once I was done with college, that feeling would go away, but I was wrong. Everyone else is moving on this odd school schedule too. You either head to grad school or you have children or your friends do and you can’t ever really escape the feeling that summer’s beginning is the end of a year. 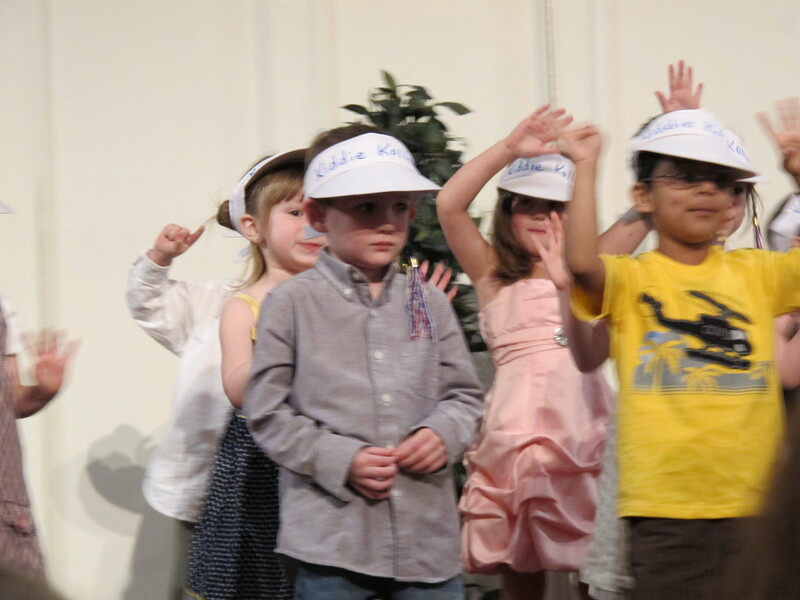 This year ends our first round of preschool. Gideon went this year because he asked to go. I hadn’t planned to let him leave my sight for two and a half hours a day for two days of the week, but he asked to go and I couldn’t really come up with a good enough reason for him not to spend time making crafts and learning how to wait his turn in a room filled with people the same size as him. He loved sitting on carpet squares and he loved the anticipation that swirled around which letter would be chosen for the week. He loved seeing his friend Evan and he loved carrying a backpack. He is also very excited about the idea of it being over. Such a big kid thing, I think. 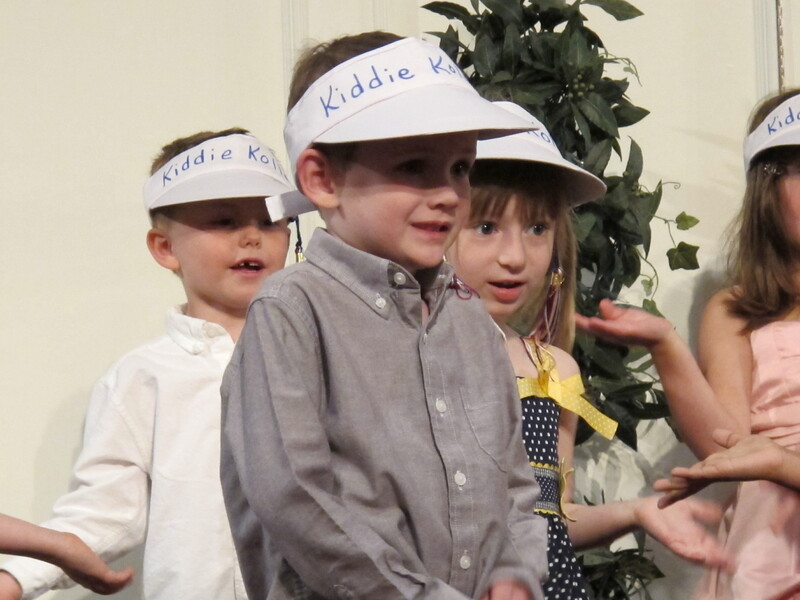 A week from today the older kids will graduate from preschool. As much as that statement makes me roll my eyes, it also makes my heart break a little bit because pre means that the real thing is coming and it can’t be possible that he is going to be doing real school. And it seems especially crazy to think that I too will be doing real school as we transform the basement and order curriculum and jump into the very real, very big world of homeschool. We’ll start off slowly this summer with phonics and math concepts and just see how quickly we want to move. I want to aim these arrows from the Lord at targets that matter and do all that is within our power to release them toward lives of productivity and spiritual maturity. We’re beginning with the end in mind. May 2026.